ESEM is a new type of scanning electron microscope, which allows the examination of specimens in the presence of gases. As a result, wet and dry, insulating or conducting and, generally, all specimens can now be viewed with no or minimal preparation, in their natural state, or in vacuum. Some aspects of the ESEM Research Laboratory in Sydney Australia. NOTE: The description below refers to the time when this laboratory was fully equipped and operational for many years. 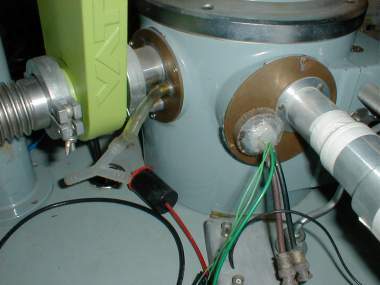 However, it was not possible to maintain the original JSM2 SEM in operation beyond a certain point (originally acquired in 1968 by the University of New South Wales). It was gifted and is now resting with the PowerHouse Museum of scientific instuments. Most activities are currently conducted by computing simulations, ancillary equipment and collaboration with research organisations and industry. First, let us bear in mind that a "private" laboratory by no means implies work of a lesser scientific content or quality. For example, Nikola Tesla , started the greatest technological revolution of the twentieth century from his private laboratory. He started first with meagre resources in order to promote the concept of a-c electricity together with his electric motor and countless other inventions, upon which we owe our modern civilization. Always in conflict with Edison and outside or separate from the scientific establishments, he is considered the "genius of electricity" and "the man who invented the twentieth century" (e.g. book by Robert Lomas, Headline Book Publishing, London, 1999). Even without his laboratory, he continued to produce scientific work until his death. Likewise, Manfred von Ardenne, the father of scanning electron microscope (SEM), had established his private research laboratory Forschungslaboratorium fur Elektronenphysik , wherefrom he became one of the world's most prolific scientist and inventor across multiple-disciplined fields of physics and medical physics. 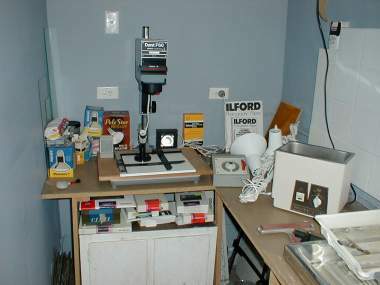 An electron microscope may be thought of as the minimum unit of equipment necessary for a laboratory to claim its corresponding name with some comfort. Since this equipment is relatively expensive, it would be generally unprofitable for an individual to invest money on it with the intention of conducting only pure scientific research. The risk would be very high. 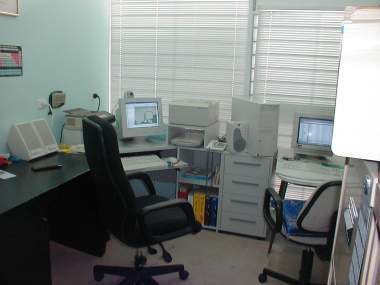 There are numerous private electron microscopy laboratories selling their services (e.g. imaging of specimens) to customers but these belong to a different group. Therefore, the ESEM Research Laboratory may be probably unique in its claim to be conducting pure research for the benefit of science and technology. This unusual situation has been possible by the convergence of some unique circumstances: (a) The willingness by a University (UNSW) and an Organization (CSIRO) to release a complete electron microscope unit along with its scientist (Dr. Danilatos). (b) The preexistence of many publications and at least one patent with several potential inventions and other patents forthcoming. (c) The emergence of a venture capital company that provided support to a private laboratory for the purposes of continuing the scientific work that had already started at the university. It is this lucky set of circumstances at the right time and the right place that have made the ESEM Research Laboratory a reality, perhaps, unique of this kind. Hence, there is no mystery. The outcome of this story has also been extraordinary. Much better quality and more volume of scientific results have been published from this Laboratory and the same individual than in the first 10 or 13 years of university environment. The explanation is again simple. Every time a new idea came about, it could be tested immediately without having to go through the bureaucratic process of the previous establishments. Direct action was possible and the results known and acted upon immediately. The only limitation to the possibilities open was imposed, in a way, by the amount of resources available but, conversely, the given resources presented also a limitless amount of ideas for this particularly new and emerging field of ESEM. Thus the practical limit was set only by the inventor himself. This is by no means a recipe or a claim for privatizing or splitting large organizations. It is only an explanation of the possibility of conducting serious scientific work from private grounds. The loss of big research power that can be found in big establishments is ameliorated, so to speak, by the benefits of autonomy (of the highest possible degree ), often avoiding time wasted in formalities, meetings, reports, politics, opposition, etc. (in this case also avoiding traffic jams or long journeys to and from the work place). There are countless of brilliant ideas that are never tested in big establishments simply because they have to pass through the protocol, policy or politics of any given time. Ironically, it is now the public establishments that seek private funding often resulting in work of lesser science, whilst this Laboratory has endeavored to promote science instead of monetary profit. It was only good fortune that generated profit that, in turn, sustained the science of ESEM which, otherwise, would have been pushed to extinction. The irony is, indeed, extreme both ways. In conclusion, to measure and appreciate the veracity of these brief words, the best approach is to apply what science preaches, namely, by searching and evaluating the publications and other material being presented through all related pages of the ESEM Research Laboratory. There are several levels of linked information, depending on the depth of understanding that the reader wishes to enter. The criterion is if the publications and other material presented herewith have or will have any lasting effect on the progress of science. 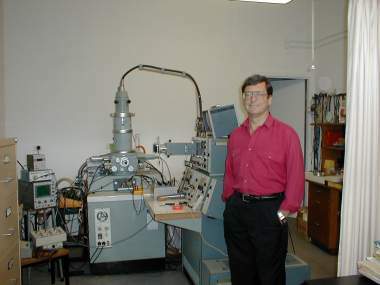 January 1978: Danilatos started work on ESEM at the University of New South Wales (UNSW). Mid-1983: ESEM equipment and Danilatos transferred to Commonwealth Scientific and Industrial Research Organization (CSIRO). Mid-1986: ESEM equipment and Danilatos transferred to and established the ESEM Research Laboratory. Collaboration with ElectroScan Corporation. Mid-1993: End of collaboration with ElectroScan. To date: ESEM Research Laboratory has continued independently on new research and publications. 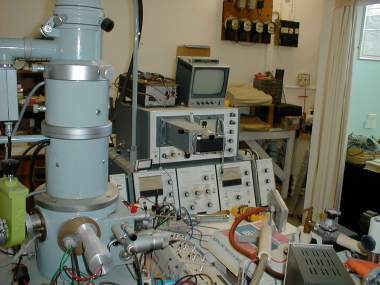 SEE MORE aspects and parts of this laboratory and note that whilst the equipment may appear outdated, the underlying physics of the electron beam is not different from modern designs of electron microscopes. The dark room photography has been superseded by modern digital imaging and processing, but the old film recording medium has produced quality of results that has not yet been bettered by any commercial ESEM to date (in 2010). This is because attention has been paid to produce the optimum signal-to-noise-ratio by practicing the best electron beam physics rather than employing computer power to clear noisy images produced by inefficient equipment.